Some of Tannery's new residents. 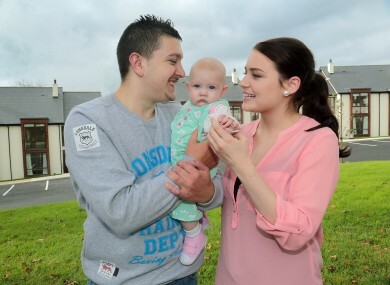 A GHOST ESTATE in Bandon is set to become home to 24 families on Cork County Council’s housing waiting list. The announcement was made today after a deal was reached by NABCO, the national co-operative housing provider, and NAMA. The new homes in Bandon are part of a larger development programme being delivered by NABCO that includes further NAMA developments in the counties of Dublin, Waterford and Wexford. The homes at the Tannery in Bandon are a mix of two, three and four-bedroom houses with gardens. NABCO is currently working on plans for housing construction at a series of sites in Dublin City. Over the coming 18 months, the organisation plans to deliver up to 300 new homes nationally. The housing model developed by NABCO enables tenants of social-rented properties to become shareholding members of their local co-operative. NAMA Chairman Frank Daly said that the organisation is committed to “finding homes for people who need them and making a wider social contribution that is consistent with our commercial mandate”. NABCO has previously worked with NAMA to deliver a housing development in Cobh, Co Cork that provided homes for thirteen local families. During a debate on homelessness in the Dáil last week, 15 local authorities were criticised for delivering “no NAMA homes whatsoever” as of June 2014. Email “24 families to be housed in Cork ghost estate”. Feedback on “24 families to be housed in Cork ghost estate”.